Thank you for all your efforts to make our pilgrimage to Ireland so special. I know everyone on the trip had an amazing experience and left with great feelings about our Irish-Franciscan history. St Francis University Alumni Group, Ireland. A group from one of America's oldest universities arrived in Ireland this month to celebrate the link between Ireland and Pittsburgh. The delegation from St Francis University travelled to Galway to trace the footsteps of six friars who departed Connemara in the 1800s on a brave journey to establish what is now regarded as one of the most prestigious universities stateside. The group, led by Fr Malachi Van Tassell, President of St Francis University in Pittsburgh travelled to Ireland in honour of the university's six founding friars who departed Galway in the 1800s. It was in 1847, at the invitation of Bishop Michael O'Connor of Pittsburgh that the six friars from the Diocese of Tuam left Roundstone and Clifden in Connemara to establish a school in Loretto. Br. Giles Carroll, Br. Domenick Lee, Br. Vincent Welstead, Br. Joseph Corcoran, Br. Peter McDermott and Br. Jerome O'Keeffe then laid the foundation of what became Saint Francis University, the oldest Franciscan University in the United States. The visit to Ireland was in honour of those six friars who left their homeland to spread the Franciscan message in the New World and this trip honoured the Franciscan heritage. Each year, during Founders Day, the university honours the six brothers and this trip brought a new dimension to remembering the hard-working and inspirational friars. 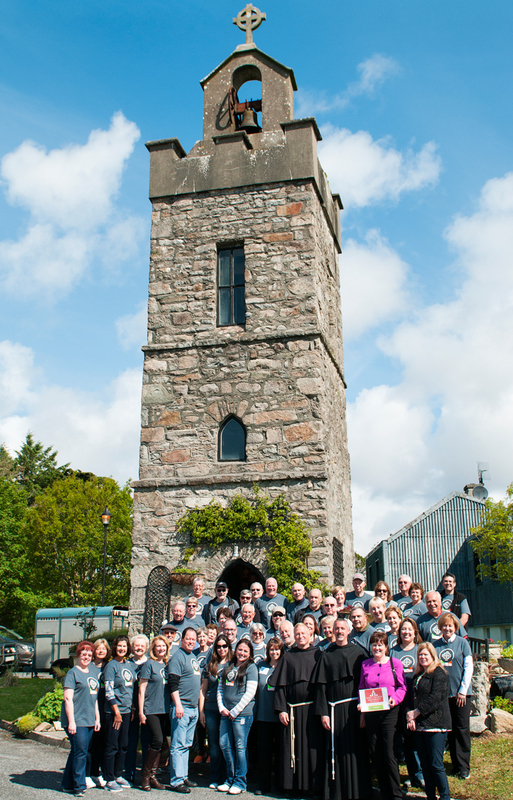 The delegates were hosted by Celtic Footstep, a destination management company based in Ireland and headed up by Kerry O'Sullivan and Kathleen McDonagh. As part of the nationwide trip, the group visited The Giants Causeway and Titanic Centre in Northern Ireland, the Book of Kells, Glendalough, Newgrange and Knock. The group arrived in Mayo on Tuesday 2 June where they visited Knock Shrine and attended mass celebrated by the Most Reverend Michael Neary, Archbishop of Tuam. During the group's visit to Ireland, the itinerary of which was organised by Celtic Footstep, the group travelled to Roundstone in Connemara and home of their Founding Friars. They learned firsthand about the brothers' Irish roots, worshipping where they worshipped and walking where they walked. They met with Br. James Mungoven from Clifden who gave a talk on the history of the Franciscan Monastery that was established in Roundstone in 1835. Br. Mungoven is a significant expert on the link between Roundstone and Pittsburgh and showed the delegates the remnants of the former Monastery in Roundstone where the six friars were based – today there remains a bell tower in its place. On Wednesday 3 June, the delegates saw Kylemore Abbey and mass was be celebrated there by Fr Malachi Van Tassell, President of St Francis University in addition to a mass on the Aran Islands on Thursday 4 June before attending a performance of Trad on The Prom in Salthill. Meeting and Celebrating Mass with the local Franciscan Brothers, Galway, Ireland. On Friday 5 June, the Franciscan Brothers at The Abbey on Francis Street, Galway welcomed the group and together they celebrated mass at 9am. This was a significant event in marking the links between Ireland and America. The itinerary that was organised is one that honours the six friars from Galway who departed Ireland, according to Kathleen McDonagh of Celtic Footstep. "This is a hugely significant visit for the delegation and one that is spiritual but very fitting to mark the achievements of the brothers that left Galway. It is an emotional experience for those visiting Galway from the USA." During their stay, the delegates carried out a number of interviews with local and national media. This is a link to a copy of a recording of a radio interview with Fr Van Tassell and Dave O' Connell, Editor of the Connacht Tribune on Galway Bay FM. Feature Article in The Connacht Tribune about the group visit to Galway, Ireland. This is one of just a number of scheduled groups that Kerry O'Sullivan and Kathleen McDonagh will bring to Galway in the next few months. In mid-May, Celtic Footstep also hosted a group from the prestigious Princeton University in America and as part of the delegation's visit; they met with Dr Jim Browne, President of NUI Galway. Celtic Footstep specialises in destination management and specialised group tours and prides itself on bringing tourists to Galway and the West over the past 20 years. Older PostPrinceton University Alumni Group Tour to Ireland's Wild Atlantic Way.